What makes Parma ham (prosciutto di Parma) so special? And what is even better? 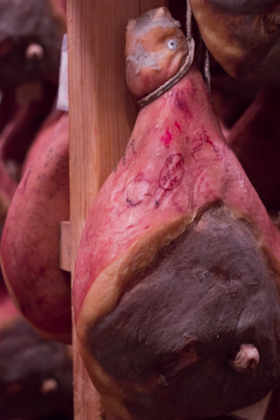 Prosciutto from Parma is the most famous cured ham in the world but what makes it so special? Also, do you know a very similar product to prosciutto di Parma (Parma ham) which is considered even more prized? Is it its historical importance? Prosciutto is an ancient food whose name means “dried” (from perexsuctum in Latin). It has been produced since Roman times and was first mentioned in text in 100BC by Cato the “Censor” as the legs of prosciutto di Parma were traded all over Italy and Greece. Is it the breed of pig used? Prosciutto di Parma is made with Large White, Landrace and Duroc breeds of pigs. The British pigs were introduced about 200 years ago. In artwork dating back to the 15th century, it shows black pigs in the pictures. 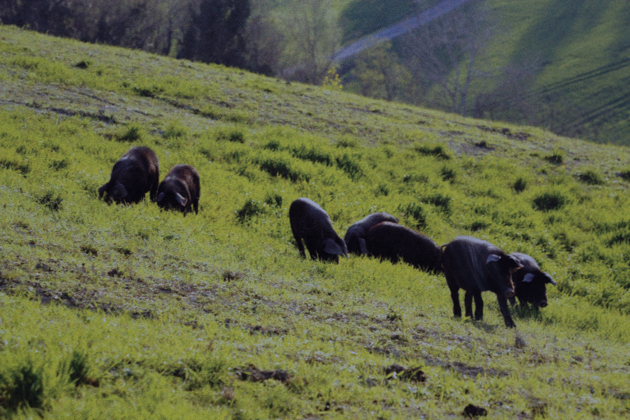 There are two types of black pigs native to the Parma area, maiale nero and maiale grigio. Some local producers are starting to use black pigs again to make prosciutto. They changed to British pigs because they grew more quickly, had a lower mortality rate and had high quality meat. The pigs must be at least 9 months old, weigh a minimum of 140 kilos (cheaper made elsewhere prosciutto is made with younger pigs). The pigs come from breeding farms that ensure the pigs’ moderate daily growth and excellent health. They feast on cereal, grains and the whey from the local production of Parmigiano-Reggiano cheese. They are treated humanely as any stress the animal experiences also affects the quality of the meat. Is it how the ham is cured? The pig skin is covered in humid sea salt while the meat is rubbed with dry salt and refrigerated at 1 to 4C and at 80% humidity for a week. Getting the right amount of salt into the meat so that it is properly cured (and bacterial growth inhibited) but maintains its sweetness is the work of an expert (the Maestro Salatore). Another layer of salt is added and the 15 kilo rear leg rests for 15 to 18 days. The leg is hung for 70 days in a refrigerator at 70% humidity while the meat darkens. The leg is washed with warm water and brushed to remove the salt. It is then hung to dry for a few days. The legs are hung on frames in rooms with large windows. 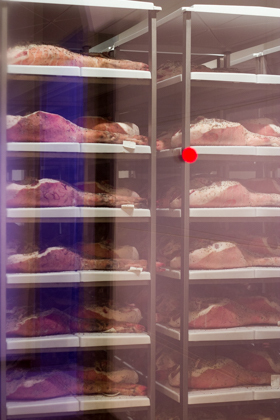 The windows are opened when the temperature and humidity are the perfect condition to allow the hams to gradually dry. This step is crucial in determining the particular quality that sets prosciutto di Parma apart. The leg is dried and rubbed with sugna (a mixture of lard, salt and rice flour) to prevent the meat from drying out. After it is moved to the cellar (where there is less air and light) where the legs will cure until they are ready. The meat should have a nice depth of flavour and be sweet. It will have lost a quarter of its weight after one year. Is it how long it is aged? While prosciutto di Parma must be aged for a minimum of one year, it ideally should be matured for 20 to 24 months to obtain its exquisite texture and flavour. Too little time and it is too soft. Too long and it can become dry. 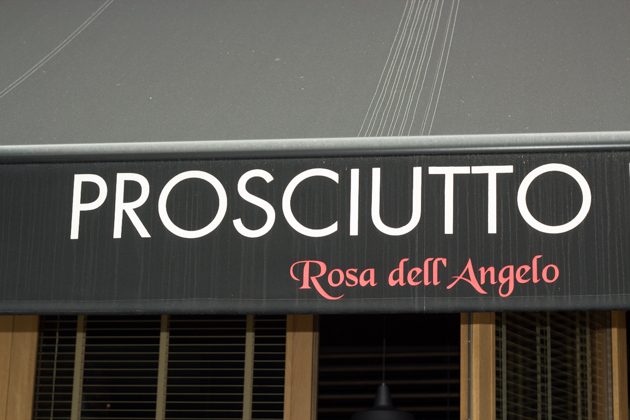 Some prosciutti (the plural of prosciutto) are aged for up to 3 years. 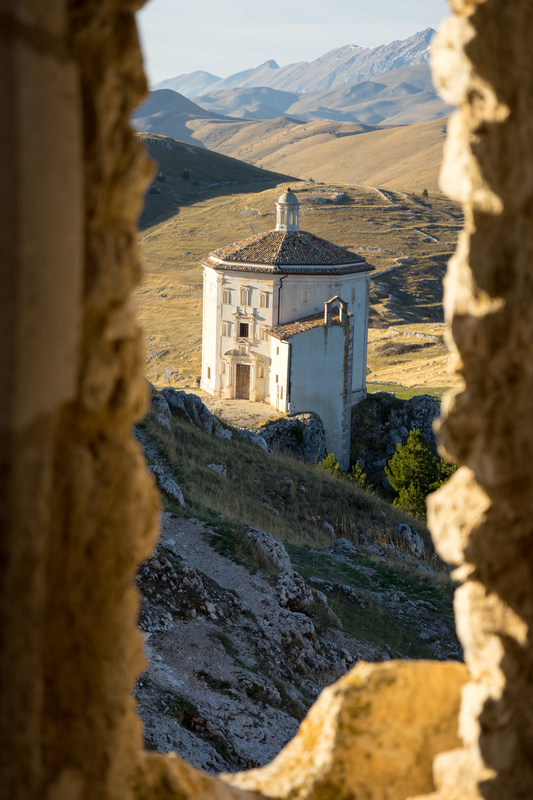 What makes prosciutto di Parma so well-known is not only the process but the microclimate of where it is produced. 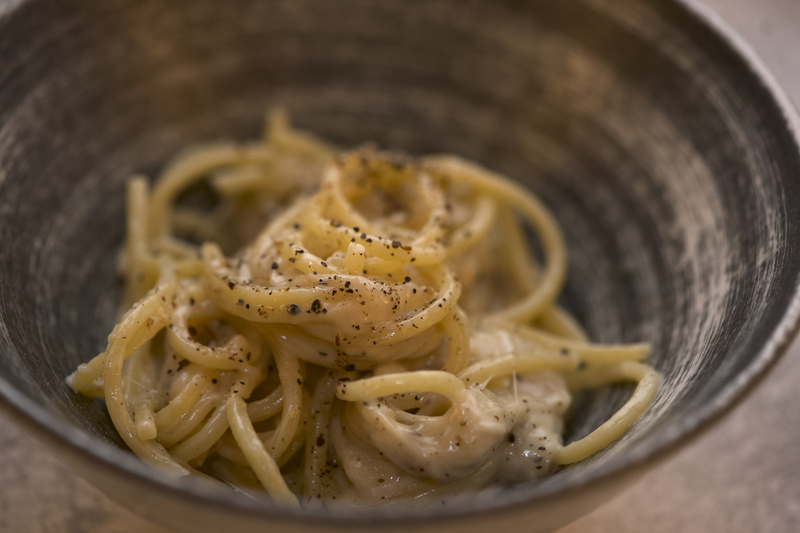 It can only be produced in the hills around Parma (5 km south of the via Emilia (an ancient Roman road), no further east than the river Enza, no further west than the river Stirone and no more than 900 m in altitude). 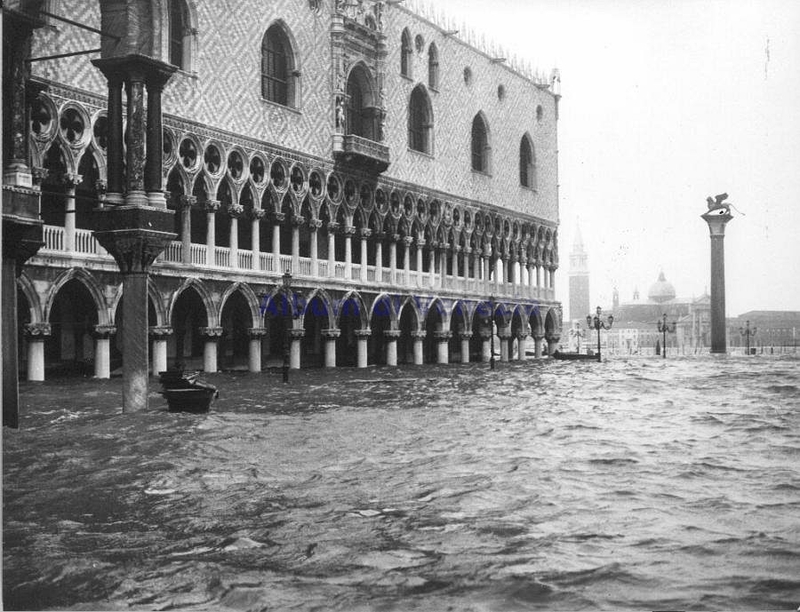 Traditionally, the prosciutti were hung in rooms with the windows open, with only the sea air blown across the region to dry the prosciutto. The sea air loses some of its saltiness after passing through the Apennine mountains and gains some sweetness from the local vegetation imbuing the prosciutto with these qualities. Is it the quality control? 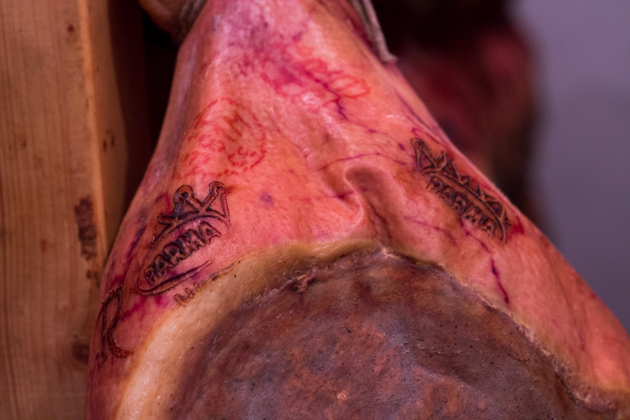 The breeding farms for prosciutto di Parma put a tattoo with the breeder’s identification code and month of birth on the legs of the pigs within 30 days of birth. At the slaughterhouse, the leg is checked and branded with “PP” and the slaughterhouse identification. 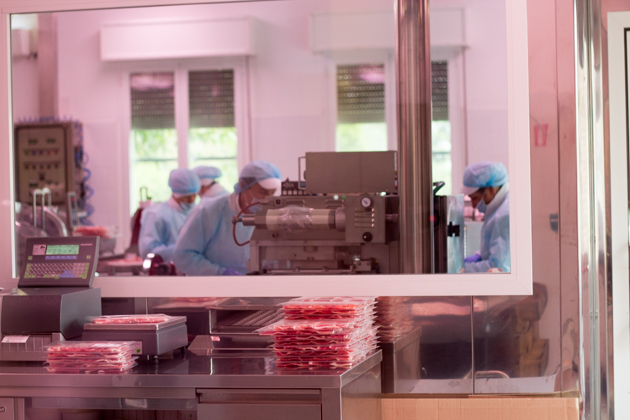 When the curing begins, the consortium places a metal seal with a “CPP” (Consorzio Prosciutto di Parma) and the date the curing started. After a minimum of one year of maturing, the consortium for prosciutto di Parma determine if a prosciutto meets the high standards to qualify for the official certification mark (the five-point ducal Parma Crown). A master tester arrives with a hollowed out horse’s bone to puncture the prosciutto in several places to extract a small piece and smell it quickly before the scent dissipates. He checks all the previous markings are present and if the prosciutto passes the test, it will be branded with the five-point crown marking. 1% of the hams will fail. Even sliced prosciutto may only be sliced and packaged in the Parma region under the supervision of IPQ inspectors to guarantee its authenticity. What is the best part of the prosciutto? 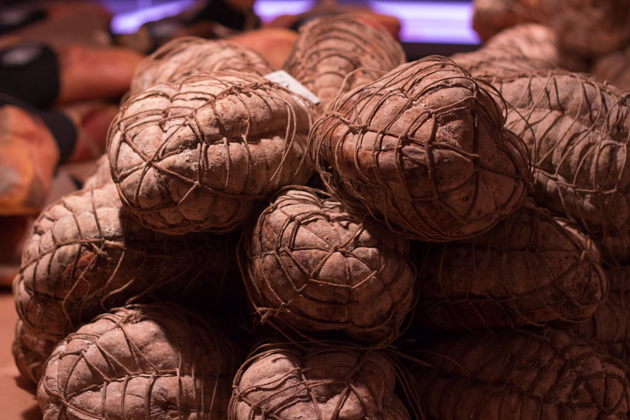 While prosciutto di Parma has about 16o producers, the most prized production similar to the prosciutto di Parma is culatello di Zibello DOP which has a much smaller production. In the humid foggy flatlands near the Po River in Emilia, culatello is produced, primarily by families, from the fatter side of the ham (the thinner side is made into fiocco di prosciutto). 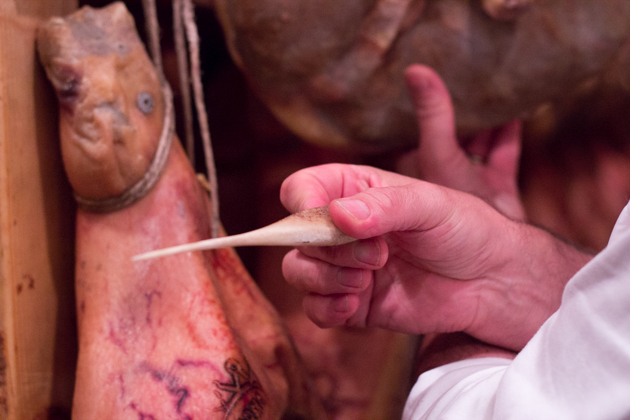 Culatello is extremely delicate and the conditions need to be perfect to make it. 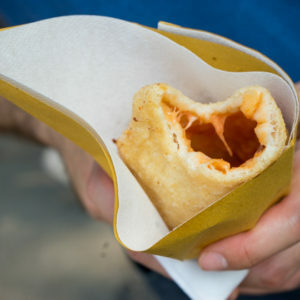 It is always made from a very fat pig that is 20 to 24 months old and requires moist air to cure it so it remains soft. To eat culatello, it needs to be soaked in wine for at least 24 hours. 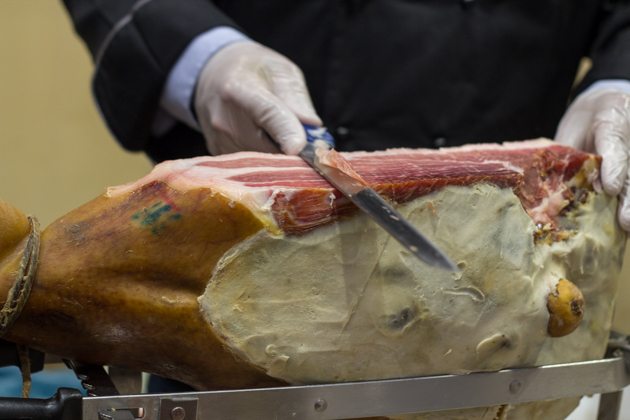 The external part of the culatello is removed, it is cleaned and thinly sliced. 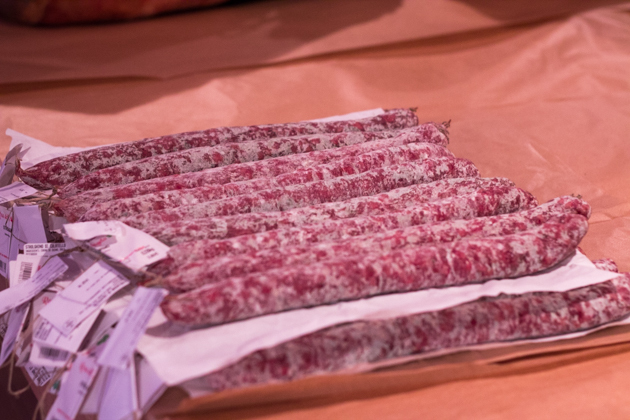 The part that is removed is chopped up and turned into strolghina della bassa and is eaten fresh within 1 month. 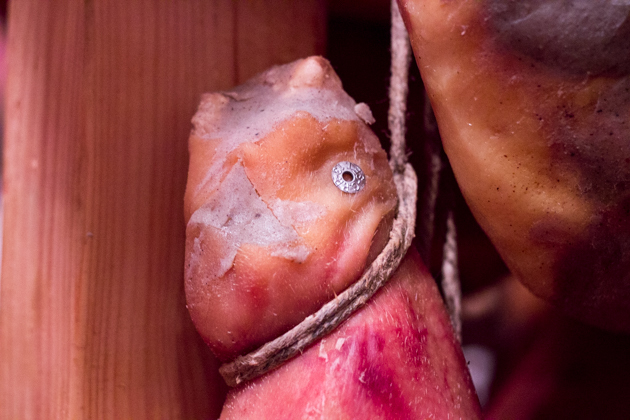 Culatello that has not been placed in a casing and instead has sugna and the skin still attached is called culaccia. What makes prosciutto di Parma so special is the depth of flavour, its texture and the balance of saltiness and sweetness. In order to create prosciutto di Parma, the pigs are carefully selected, the salt mixtures must be expertly applied in order to preserve them, the air and care taken during the curing process must be perfect, time must be allowed to mature the prosciutto and the control must be in place to ensure its uniformly high quality. If you need any more reasons to try it aside from its artisanal process, Parma ham is rich in vitamins B1, B6, B12, PP, phosphorus, zinc, iron, selenium, free amino acids and oleic acids. It also has almost twice as many unsaturated fats than saturated fats. It is easily digestible and loved by young and old alike. 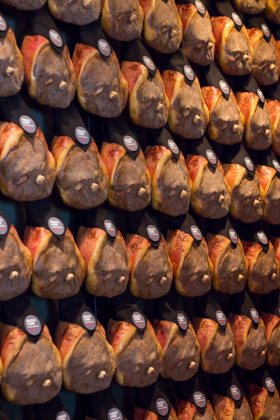 Just over a quarter of Parma hams are sold abroad. 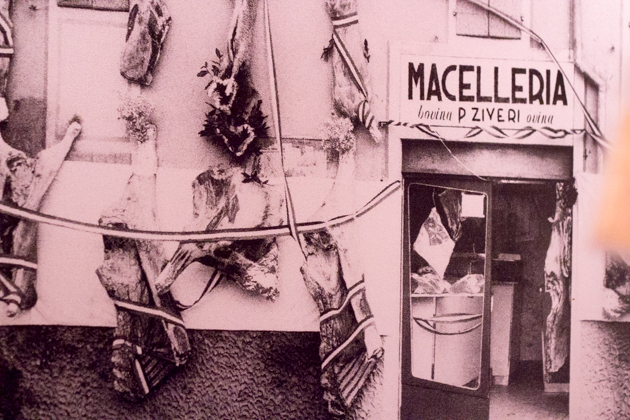 Culatello‘s production is even more limited to 21 companies and even fewer are exported. If you have the opportunity to try culatello, please do. You won’t regret it. We visited Rosa dell’ Angelo, a prosciutto di Parma producer. You can arrange a visit with them directly or ring the consortium for them to arrange a tour for you. 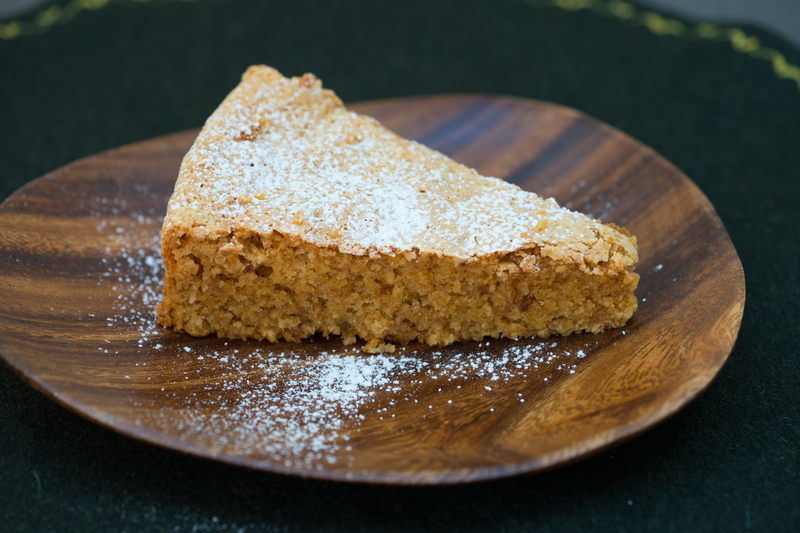 « Looking for a healthy, versatile dish with a long shelf-life?